For the remainder of January your challenge is to create something with the NEWEST scrapbooking product you have at the time of making. Creations can be anything papercraft related, it doesn't have to just be a scrapbooking layout. We want to see creativeness in the best form you know how! Beautiful! 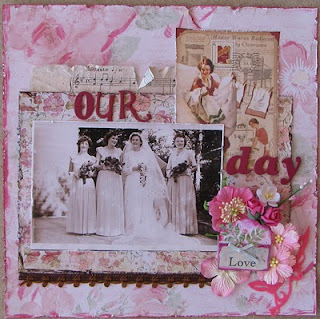 I love the cluster of flowers and the vintage pic! ooohhh....fabulous eye candy! I soooo love vintage layouts and love the soft & romatnic color choices...gorgeous pic too. Thanks for playing iwth us; don't be a stranger. Love your beautiful layout! Thanks so much for participating in the challenge at Candy Shoppe Designs!